Send the corresponding documents (copies of guarantee letters and accompanying documents such as licenses, certificates, etc.) when you create your banner or edit it. You can attach up to ten files. The total file size must not exceed 30 MB. If you have more than ten files, combine several documents into a PDF. Go to the banner and attach the appropriate documents in the Documents field. Indicate the banner number in the corresponding field. 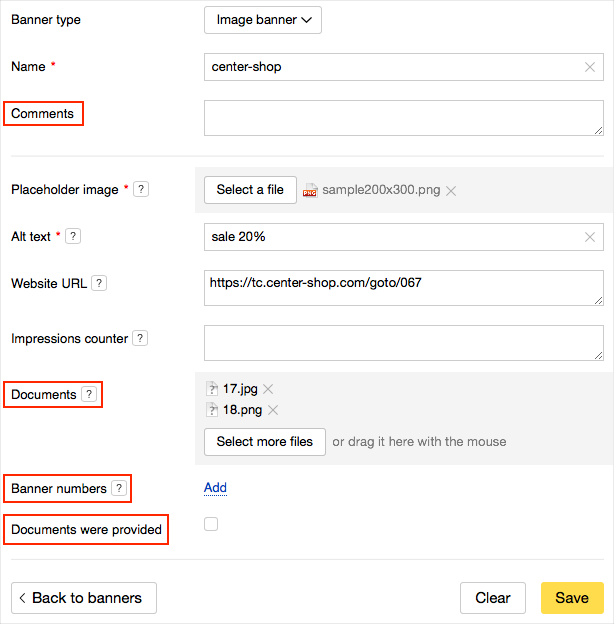 After uploading the documents, go to the banners that the documents apply to and indicate where the documents are located in the Banner number field. Go to the banner and attach the appropriate documents. If some of your documents already passed moderation, you don't need to send those ones again. Check the box indicating that you already submitted documents for that banner and indicate where those documents are located using the Comments field (in the case that some of the previous documents were uploaded and accepted for a different banner). You do not need to re-submit these documents. The service already has all documents that passed moderation. Check the box indicating that you already submitted documents for that banner and indicate where those documents are located using the Banner number field.